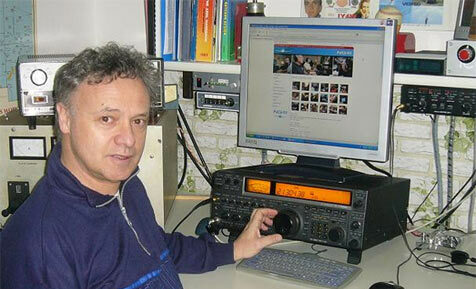 The NQ4I Multi-Multi Team is pleased to announce that well known European operator Clay I4LEC will be joining the team on 20m for the WPX SSB Test...Clay brings a wealth of multi language skills and is very well known in European contesting circles...we at NQ4I are very happy to have him as a part of our operator team this year. On August 7th, 2009 I had the pleasure to fly to Kona, Hi, and after checking into the hotel my Co-Captain and I took the rental car and make the trek over the hills to the other side of the Big Island to the qth of Bill KH7XS….as we drove up and up and up to his qth, the view that was presented was anything short of spectacular! Over 900 feet above the Pacific Ocean was the qth of KH7XS…it was graced with a 150 foot Rohn 55 tower and the antennas attached were inspiring to say the least…a pair of M-squared 4 element 40m yagis were stacked along with a trio of KT36XA’s….the view of the horizon from North America back around to Japan was unbelievable!! NQ4I traveled to Bologna and met long time friend Clay I4LEC...Clay and Rick toured IR4X, IR4M, and IY4FGM stations and then went to the home qth of the big signal from Bologna I4LEC!! Wow what and excellent qth....approximately 1200 ft above sea level and with a spectacular take off angle in almost every direction! Clay and his wonderful YL Francessca hosted NQ4I for dinner and the following day a BBQ....the food was excellent! And the company was fantastic too!! NQ4I and I4LEC amde a 2 hour drive from Bologna to Monte Codruzzo to see the fantastic IR4M Super Station...it is located approximately 3000 ft above sea level with fantastic views to NA and JA ...over looking the Adriatic Sea, there is no doubt that as this station builds up it will be a force to be reckoned with! Located on Mont Capra about 15 miles from downtown Bologna on Mont Capra...approx 1500 feet above sea level and a qth with a 360 degree view of the horizon! Unbelievable!!. Fairly modest antennas, but the station has a long history of winning! The picture with me in it shows some of the many awards they have won over the years! NCCC Contesters from Left-To-Right are: K6UFO, N6TV, N6XI, (NQ4I), N6DE, K9YC, K6VVA. Rick recently had the opportunity to visit the RU1A superstation. Thanks to RA1AIP for his generosity during the trip. Rick's impromptu meeting at the Airport Hilton in Helenski, Finland with some OH hams - OH6LI,OH3BU, and OH3BHL. NQ4I Op, Charlie Wooten (NF4A, J79PC), operating from J7DX during the 2008 ARRL DX CW test. Rick's visit in India with Paddy, VU2PEP. New 20M Beam - 8 elements 86 foot boom - Installed! Hi Guys...well it took all day Saturday to get it up....on site were WI4R, N4EU, KD4ONL, VE7ZO, and NQ4I.....we labored all day, and now the Big Boy is up!! !